to lend a helping hand to Perry High School graduating seniors seeking more education. Your annual newsletter will be sent in early spring to EVERY PHS grad (membership not required). Have you moved? Here is my new address. Do you have a new email address or want to opt-in to receive your newsletter by email? Here is my new email address. Congratulations to the 2018 PHS Alumni Association, Inc. scholarship recipients! 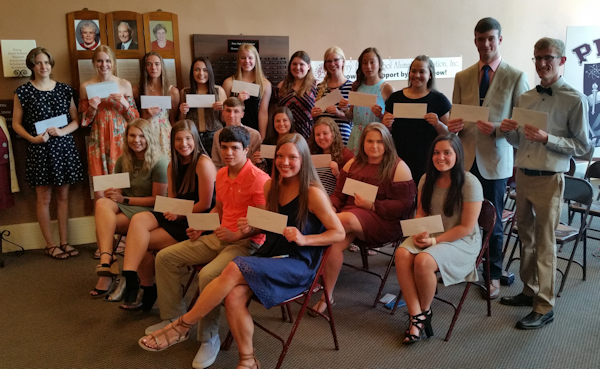 A total of twenty one (21) $1800 scholarship recipients were announced at a reception held in May at the PHSAAI headquarters at 606 Cedar Street. Receiving the Perry High School Alumni scholarships are: Samantha Adams, Korbyn Carter, Alexandra Dillon, Christina Douglass, Zoe Freeman, Brailey Gilbreath, Cadence Givens, Rebekah Hinkle, Avary Justus, Trevin Lamirand, Trey Layne, Ashton Looper, Morgan Malget, Chloe Pierce, Addison Shields, Dallan Thomas, Chloe VanZant, and Gina Wilson. Receiving the two scholarships in memory of Jack Divine are Riley Cinnamon and Alex Valencia. Jack Divine, son of John Divine, was a wrester for PHS, so these scholarships were awarded to PHS wrestlers. The Brown Knox scholarship for a student going into education was awarded to Independence Stilwell. The PHS seniors and their families toured the building and enjoyed refreshments provided by the Board of Directors. President Peggy Haxton welcomed everyone and told some history of the building and the organization. Connie Betchan, Chairman of the Scholarship Committee, announced the scholarship recipients.